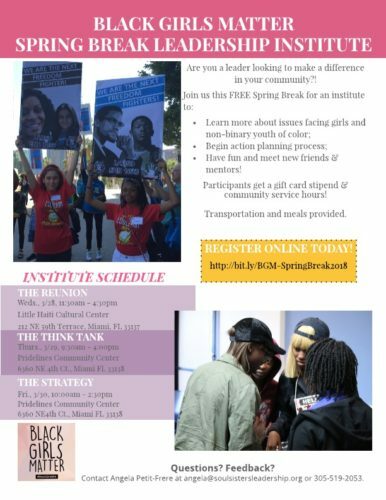 The purpose of the Institute is to give Black Girls Matter Youth and Coalition members an opportunity to collaborate on issues relevant to youth. This three day institute is a time to gather for fun, mingling, as well as brainstorming. This is a a great opportunity for youth to grow and develop as leaders. Participants will receive a gift card stipend as well as community service hours! Lunch will be provided for the duration of the institute!